I bet the closets are all full of tinfoil hats and straight-jackets because that woman was nuts! Who in their right mind would spend twenty million dollars building something that is totally worthless? I would still like to go there and see it though, just because it is so unusual. As the website says about the house...beautiful but bizarre. Took a tour of the joint many years ago. If you are in the area, be sure to take the tour of the mansion. Sarah Winchester was guilt ridden - having become extremely wealthy from her families Winchester rifle fortune. Sarah was heiress of the famous Winchester repeating rifle fortune. She felt many in the afterlife might be after her because of this. Having been slain perhaps by the rifle that made her very rich. She had contractors build rooms constantly in her home, feeling that if the building ever stopped, she would die. So rooms and rooms, and more rooms were being built. She was also worried ghosts might torment her, so many of the rooms were designed to confuse ghosts. Some have stairways that lead up to ceilings, Bizarre confusing floor plans... confusing passageways. It is a true labyrinth, or maze, with many secret passages. Tour guides must warn people not to stray from the group or they could be lost for hours! 160 rooms! Mrs. Winchester enacted a nightly séance to help with her building plans and for protection from “bad” spirits. While she sometimes drew up simple sketches of the building ideas, there were never any blueprints….or building inspectors! In the morning, she would meet with John Hansen, her dutiful foreman, and go over new changes and additions. During the early years of construction, this resulted in some awkward and impractical concepts such as columns being installed upside down – though some suggest this was done deliberately to confuse the evil spirits. But this is how the Winchester Mystery House™ became known as “the house built by the spirits.” Contractor John Hansen stayed with Mrs. Winchester for many years, redoing scores of rooms, remodeling them one week and tearing them apart the next. In the heart of Silicon Valley, it shows superstitions of a bygone era. It is easy to imagine how the combined grief of losing both a child and a spouse could be very crippling. But if you had $20,000,000 and all the time in the world to help you cope, can you imagine what you would do? Mrs. Sarah L. Winchester’s response to the deaths of her child and husband left a bizarre and impressive architectural reflection of her psyche. She gave generously to many worthwhile causes, as well to family and her servants. We have a house like that in Victoria, BC. Canada. Another frightened woman who built and built until....she died anyway. I can only tell there are red words or something red on the screen. I don't know how any of you can read it. it hardly even shows. It looks like a black screen to me. I think maybe the one I have is Auntyms house. If I could only read it. Did she build and build to it? with a door which lead no where. ? This woman was crazy.. I could not see any purpose to it. In the suburbs of San Jose, California lies a house with a mystery. and a mystery that will never die. The story of the Winchester House starts back in the 1800's. Sarah Lockwood Pardee married William Winchester, founder of the Winchester Rifle in 1862. Their only child, a six-month old daughter died in 1866. William died of tuberculosis only a short time later. The distraught Sarah visited a psychic who told her the deaths were revenge from the ghosts of those killed by Winchester Rifles, and that Sarah could escape the same fate as her daughter and husband by moving west and building a house for the spirits. 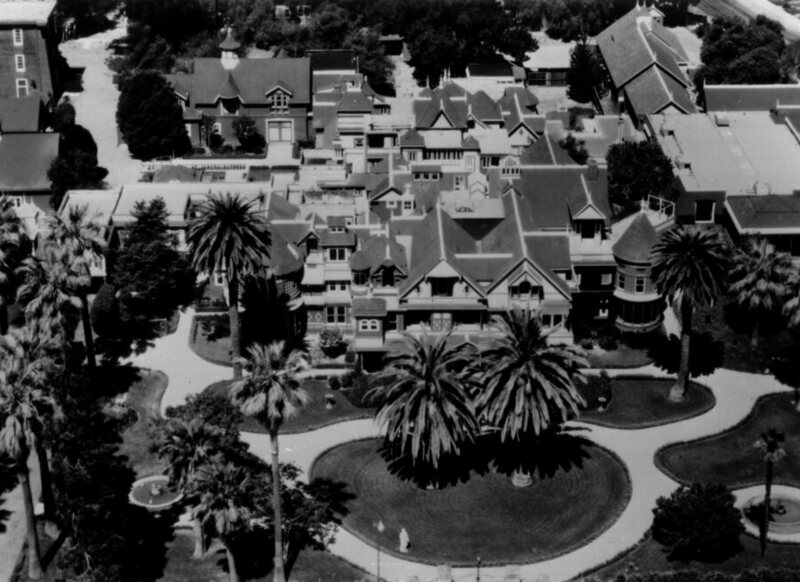 Sarah Winchester took her $20 million cash inheritance and $1,000 a day income and moved west to California in 1884. She bought an unfinished, eight-room farmhouse near San Jose, California and started construction. 107 builders worked 24 hours a day, 7 days a week, for the next 38 years. The house grew every day swallowing up everything around it, including the barn and water tower. Every night, Sarah retreated to her seance room to consult the spirits, who gave her building instructions. The spirits seemed to have an elaborate design scheme. Bathrooms inside of bathrooms, staircases leading to the ceiling, and trap doors that lead to a two-story drop. Without a doubt the most detailed and expensive room was the Ballroom. This was Winchester's most elaborate creation. 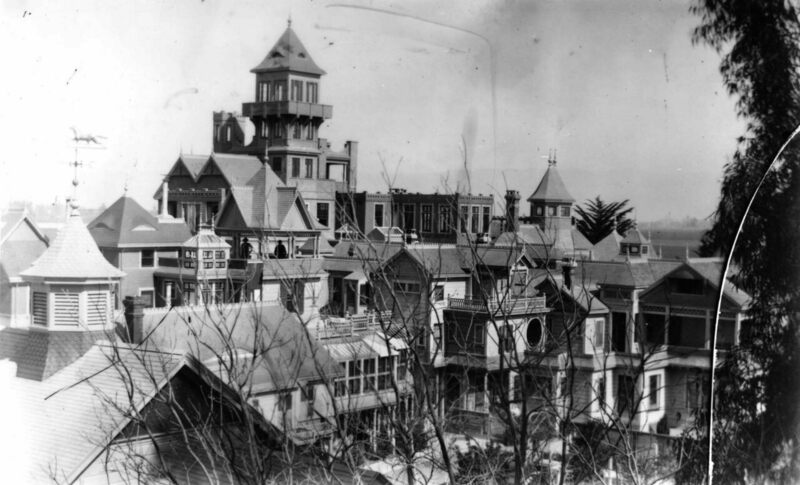 By April, 1906, the Winchester House rose seven stories high. A massive earthquake struck, setting off fires that destroyed much of the house. Sarah believed that the earthquake was a message from the spirits that she was spending too much time in the front rooms. She boarded up 30 of them, blocking access to her new $3,000 front doors, and never used them again. Sarah spent over $5 million rebuilding the bizarre Winchester House, but it didn't insure her immortality. She died in her sleep on September 5, 1922. Construction stopped abruptly. Some say the carpenters were so happy to be done that they stopped without even hammering in the nail they were working on. At her death, Winchester had created a sprawling structure that covered six acres with 160 rooms, 13 bathrooms, 6 kitchens, 40 staircases, 47 fireplaces, 2,000 doors and 10,000 windows. Many believe that the spirits of both Sarah and the victims of the Winchester rifle still reside in the house. Most people see these spirits manifested as orbs. In spring, 2003, a photograph was taken on the third floor inside the parlor, that shows a ghostly apparition. Many believe that this woman dressed in 19th century is in fact Sarah Winchester. Is the Winchester House really haunted, or does its appearance and design only point to a woman who's fascination with death has her doing anything to achieve immortality? I could see it better but faint. It is the same house I taped. On the TV documentary it took you through much of the house. What I remember most as I have not watched it in years was the crazy walls and door ways. Not any thing like a normal home that is for sure. Who would put a door leading outdoors up off the ground? Fire exscape?.. lol .. Unblievable. If I can find it or come across it by accidnet. I will see if any thing was written about the home which is not in this video. Thank you sky. I did not see your post till I blew it up and fumble through it.. sorry.. Under new management, the labyrinthine mansion is giving up more of its closely guarded secrets. Magnuson wanted to open some of these rooms to the public, but not all of the house’s long-term employees agreed. “Some of them were very protective,” he says. “Some of them really enjoy the spaces being something only employees know about.” Magnuson’s vision won out, as he made the decision to restore the front wing of the house to its Victorian-style, albeit sometimes unfinished, glory, and then share it with visitors. One of the first things you notice upon approaching the Winchester Mystery House is that the front door is not aligned with the roof peak above it—it is staggered slightly to the right. This might be a minor detail, but it hints at the disorder that unfolds within. The mastermind behind this architectural oddity—a sprawling Queen Anne Revival with 160 rooms—was Sarah Winchester, the widow of rifle magnate William Winchester. Famously private and eccentric, she built onto her California home on and off for more than 30 years. Legend has it that she did it to appease or confuse the ghosts of people killed by Winchester rifles. Getting to know the house is, in a strange way, like getting to know the woman who built it—and no ghost stories are necessary to marvel at its creativity and ambition. Winchester inherited $20 million after her husband died in 1881, and not long afterward moved from New Haven, Connecticut, to an eight-room farmhouse in orchard-studded Santa Clara Valley. She got to work almost immediately. A dedicated crew of carpenters built new rooms so quickly that no one bothered to draw up blueprints. And she didn’t hesitate to make unorthodox building decisions—a stairway ascending to a wall, a closet about an inch deep, a “door to nowhere” that opens to empty space. After she died in 1922, businessman John Brown rented the house, christened it a tourist attraction, and later purchased it outright. It has been a beloved piece of quirky, creepy Americana since it opened. More than 12 million slack-jawed visitors have followed a planned route through Winchester’s singular vision. Other than household staff, few saw the home’s interior during Winchester’s lifetime. She kept to herself following the deaths of her husband and infant daughter, Annie, from illness. For the most part, no one was permitted even to photograph her. “There’s a story about Teddy Roosevelt making an appearance in San Jose and wanting an audience with the Winchester widow,” says Magnuson. “He knocked on the front door and was not even let in.” Her eccentricity and the ghost stories—not to mention the scandal of a woman living autonomous and alone—have always been amplified in the house’s history. More striking, though, is the extraordinary artistic freedom she exercised in creating it, as well as the lengths to which today’s staff must go to keep the house intact and open. An aerial view of the house. For decades, guests have followed more or less the same path, a guided tour that takes them through a hundred-plus rooms. It starts in the courtyard, passes through a carriage entrance hall and into spaces such as the wood-paneled Venetian Dining Room and the Grand Ballroom, where Winchester installed stained-glass windows featuring cryptic quotes from Shakespeare: “Wide unclasp the tables of their thoughts” and “These same thoughts people this little world” (from Troilus and Cressida and Richard II, respectively). Magnuson’s thought was to mix this up with new spaces to attract new and returning visitors. His restoration plan began in August 2016. After ten intense months, 40 hidden spaces—including some even the staff had only rarely seen—opened to the public in May 2017. Some heroic construction work went into making sure the new spaces were safe, according to Michael Taffe, head of the house’s operations and maintenance team. “There’s a lot of modifications to actually make that a route,” he says. “You had raw redwood that wasn’t finished; it had to be framed and covered with plaster.” Wonky nails were pounded flat, old earthquake debris was cleared out, and floorboards installed. One particular attic space took the most effort, says longtime house historian Janan Boehme, who helped with the restoration plans. “That essentially was just a platform with holes in it. There were staircases and things, but there was no railing, there was no safety at all,” she says. “If you walked across, you’d just fall through a hole.” The maintenance team had to build a new wooden walkway through the space. All of this work was necessary, in part, because after the earthquake, Winchester had almost entirely abandoned the front wing of the house. “She just kind of stopped building in these areas, didn’t finish them up,” Taffe says. “But you can tell little remnants of what the rooms looked like before the quake.” Those clues—a glazed tile here, a stretch of wallpaper there—have helped the restoration effort. One newly spiffed-up space, the dining room, is kitted out with period furnishings and textured, fondant-like wallpaper that was popular among well-off Victorians. There was some residual damage to the wallpaper from the earthquake, so craftspeople had to take molds of the surviving paper so they could recreate it. (The dining room is not part of the new tour, but is available for special events. By design, the restoration left some intriguing rough edges. Near the home’s front door—now in use again—is a room with bare-board walls and a shallow butler’s pantry at the back, like a book squeezed into the end of a shelf. “She often would carve little spaces out of what existed,” Boehme explains. An empty hearth also gapes not far from the entryway. After the quake, Winchester had mantles and fronts torn off fireplaces and their brick chimneys encased in metal, probably so they wouldn’t crumble in the event of another disaster. The front hall staircase leads to a Tiffany-style stained-glass window that surely once provided bright beams of color. But it was later completely enclosed by a new exterior wall, presumably put up at Winchester’s request. Today, some strings of tiny lights illuminate it from behind. The darkened window, however, is an anomaly. Though the house has a reputation as a dim warren, its estimated 10,000 panes of glass reflect Winchester’s desire for natural light. At one point, an outdoor patio was enclosed, so she had a skylight installed in its floor to pull light from above into the newly shrouded room below. It’s as though she carved tunnels through the house to let light penetrate. The staircase landing opens onto an array of finished and unfinished rooms, including the Crystal Bedroom, where pale yellow, mica-flecked wallpaper gives the walls a luminous quality. One reason this room had been off-limits for so many years is concern about what sunlight might do to the wallpaper, so at some point it may need to be sealed off again. “But it’s friendly, at least,” Boehme interjects. “Yeah, I’ve never been terrified,” Taffe says.